allround geek: OLPC in trouble. Capitalism is an ugly system. OLPC in trouble. Capitalism is an ugly system. Nicholas Negroponde announced that the organization is laying off half of the staff due to economic difficulties. Basically what that means is that the OLPC laptop is not selling as much as it was expected and the organization did not take as many preorders as projected (or that some preorders where canceled due to some shady events....). When OLPC was first announced everybody was talking about it and everybody wanted one. It had a open hardware/software approach that many people liked and the idea behind it was "free education for underprivileged kids of developing countries". Who could object to that? Some companies that discovered a new market maybe? Capitalism is an ugly system. 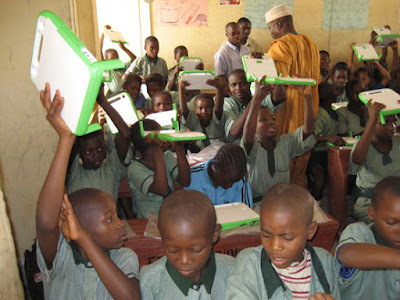 As soon as word got out, many big companies starting producing their own cheap netbooks and offering countries their solution to compete with the open architecture of OLPC. There were even stories that got out about bribing third world country officials for canceling OLPC orders and choose another solution of a certain company. You think these kids would benefit from windows?